Revisit Far Cry 5's Montana, which hasn't changed all that much despite the apocalypse. You'd think a nuke being dropped on Montana would have changed it somewhat, but Far Cry New Dawn's post-apocalyptic version of Hope County is essentially the same one we know from Far Cry 5. Once again the locals are being terrorized by armed gangs speeding around in infinite trucks while furious bears and homicidal turkeys leap from the bushes to claw at anything that moves. New Dawn adds a couple new twists to the series' formula—at times you can leave Montana to visit other states—but nothing to make it feel like a wholly different game. This is Far Cry 5 again, just on a smaller scale and with more pink flowers. It's years after the nukes fell at the end of Far Cry 5, and your nameless character has been traveling the country by rail, helping survivors rebuild the post-apocalyptic United States. A group of highwaymen (not that cleverly called the 'Highwaymen') derail your train and leave you stranded. After making your way to a small community called Prosperity, you venture out into the overgrown remains of Hope County, fighting the Highwaymen, conquering outposts, gathering resources for crafting, and enlisting a small cadre of colorful companions like an elderly sniper and an enormous, rampaging boar. This goes without saying, but never bring the sniper with you. Always bring the boar. As you help out the locals you gain perk points that can be used to unlock skills in any order you wish, a nice and loose ability system that lets you focus on whatever is most important to your playstyle, be it melee damage, stealth kills, or traversal tools like the wingsuit (fun for sightseeing and bailing out of burning choppers) and grappling hook (mostly just for treasure-hunting in bunkers and caves) . A few perks, like how much ammo you can carry and how hard you punch, can be upgraded endlessly, giving you even more flexibility in your build. A set of five new skills introduced near the end of the game indulge a bit more ridiculousness, giving you fun powers like a double jump and limited-time berserker strength. Now when I swing my spiked baseball bat at a rampaging bear it sails comically through the air. 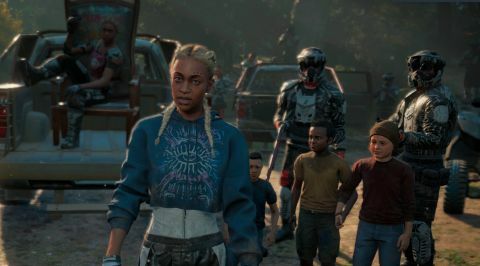 The Far Cry games have always cast you as an army of one, but New Dawn turns you into a legit superhero. These powers are novel for a bit, but feel a little unnecessary when I'm already able to insta-kill with stealth takedowns and spawn an endless supply of helicopters. With a GTX 980 at 1920x1080 on Ultra settings Far Cry New Dawn ran very well for me, with framerates hitting as high as 80 but more typically around 60-65 fps. Occasionally there were dips down to mid-50s but overall it was a very smooth ride, and that's pretty rare for my PC with everything turned up (except for motion blur, which was turned off). New Dawn has a benchmark utility and I'll post the full results soon. Combat is the same frantic and fun gunplay as in the past few Far Cry games. Vehicles and barrels explode, fire spreads across grass and trees, enemies recklessly charge and scream and bombard you with mortars or light you up with flamethrowers, with the occasional wild animal or friendly citizen getting caught up in the chaos. Speaking of wild animals, my loyal boar Horatio compliments my ranged attacks as a tank, scattering screaming Highwaymen like bowling pins so I can more easily pick them off with my sniper rifle before running in to clean up with my shotgun or knife. The longer a companion is with you, the more skills they develop, and midway through New Dawn my big pig (really the only companion I used) was even able to self-revive himself, meaning I could turn him loose without having to keep an eye him. Plus, Horatio has lots of personality, paddling around in the water while I'm fishing and sometimes falling asleep and snoring softly while I'm hanging out in Prosperity. You can co-op New Dawn with a friend, but seeing an enraged boar headbutt a truck onto its side is pretty priceless. Your arsenal is meant to look like improvised, ramshackle weapons—silencers look like bottles, your sniper scope has a plumbing valve on it—but the post-apocalyptic vibe is only skin deep. Ammo and crafting resources are so plentiful you never feel like you're scavenging, just shopping. Cars may be rusty and covered with warpaint, but I never felt like Mad Max. You have a seriously OP crossbow that shoots rebounding circular saw blades that can take down several enemies at once, though I'm disappointed it doesn't shear off limbs or cut dudes in half. What's the point of flying saw blades if you're not detaching heads from bodies? There are plenty of familiar landmarks on this smaller version of the map (radiation has closed off a portion of it) and several familiar (yet older) characters from the last game are still around. I think we're meant to feel a bit wistful about Hope County—a quest has you collecting old photographs to help you remember what the landscape looked like before the bombs—but it's hard to feel like there's much difference between the world's chaotic past and present, and Far Cry 5 was only just last year so it's not exactly a nostalgia trip. You can make a few expeditions out of Montana, raiding larger and more imaginative enemy outposts off the main map, like an aircraft carrier on the coast, a ruined amusement park in Louisiana, and even Alcatraz. These expeditions are much more challenging than outposts in that they spawn unlimited enemies until you escape via a timed chopper rescue, so they can't be taken down by stealth alone—the bad guys will find you. Plus, you can't just glide to safety in your wingsuit when things don't go your way: these are self-contained excursions that you either pass or fail. You can escape with loot or die and do the whole thing over, which gives expeditions a bit of tension. Expeditions take you far from Montana. Not sad to see a fallen tower in a Ubisoft game. Plenty of wildlife, most of it angry. You companions hang out together (again) when they're not with you. The bad guys aren't the only one with choppers. Then and now. Not much different, really. Bouncing a blade off a baddie. You're about 20 years late for church. The big bads of New Dawn, twin sisters Mickey and Lou, are so inconsequential I almost forgot to mention them. Unlike the Seed family in Far Cry 5, they aren't constantly subjecting you to long, drawn out speeches (thank you). The twins only appear a few times, and mostly just issue brief threats over the radio to remind you they exist. It's considerate of them to basically leave you alone while you completely dismantle their entire army, but it makes your final showdown with them just another bullet-sponge bossfight. I completed the main story quest of Far Cry New Dawn in about a dozen hours, and spent a few more mopping up side-quests and exploring. It's brief compared to Far Cry 5, and completable without fully upgrading Prosperity to access the highest levels of gear and vehicles (though you'll definitely want to unlock the best weapons). While it's good fun at times, New Dawn is really just a quick trip back to Far Cry 5's Montana that hasn't changed much beyond a post-apocalyptic paint job.